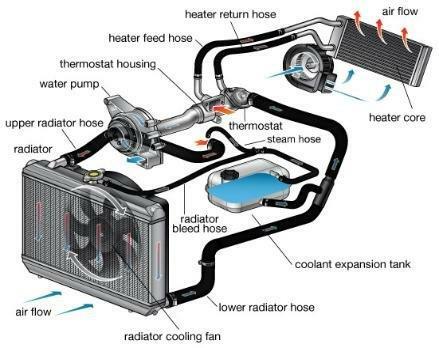 A car cooling system consists of a radiator, radiator hoses, heater, heater hoses, thermostat, water pump and special coolant. Radiator fans. The internal combustion engine runs @ over 300 degrees Celsius which left alone would eventually seize from overheating causing rotating components to bind-with the aid of oil in the sump a cooling system is added externally around the engine block-transferring excessive heat away from the engine block to the radiator where heat is transferred to the radiator fins for cooling, A pump is added (hence water pump) circulating the coolant around the block ensuing even distribution coolant flowing thus avoiding `hot spots`.as mentioned earlier-combustion temperatures are at 300 c. A thermostat or temperature valve is fitted to ensure the engine is at a required temperature before the valve opens causing the coolant to flow at around 85 degrees Celsius. With the aid of cycling cooling fans drawing air through the radiator-the temperature of the internal engine can be controlled. Coolant has a special chemical which aids cooling, lubricates, stops rust deposits and stops a unique electrical charge being created called ELECTROLISIS- which in turn eats away alloy in the cylinder head. For immediate cooling system service and repairs please call Manny @ MANNYS MECHANICAL REPAIRS @ 0411 496 621.